Usually, I write about stuff that would appeal to all sorts of musicians. I try to appeal to both amateurs and professionals. But not all music topics will be for all musicians. So today, I’m focusing on those of you who are professional musicians or aspiring professionals: career paths for musicians. A music career is very difficult. Pro and aspiring pro musicians often have to work multiple jobs to bring in enough income. It is not impossible to become a professional musician; technology has actually made it easier than ever. 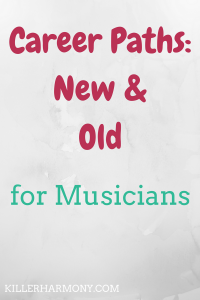 In this post, we are going to explore some different career paths for musicians. Some common, others not so common. Most musicians have what is called a portfolio career. They do multiple different things. Performing on the weekend and teaching during the week is a common combination. Some musicians even have day jobs outside of music. They pursue music on the side until they can do it full time. A portfolio career is important for any musician. You don’t want to rely on one stream of income. If you’re a performer and suffer from a huge injury, you need something else to fall back on until you are well enough to perform. A composer needs another way to make their income in case they have a bad bout of writers block. If you’re a musician who plays or works in the music industry professionally, you need options. This blog post will help you figure out those options that are right for you. Related: Portfolio Careers: What, Why, Who? This is the most common career path in music, and it is also the most competitive. It is also the most draining, because performing usually means a lot of time spent traveling. But performing solo, in a chamber group, or in a larger orchestra can be a fulfilling career path. Most performers supplement their income in other ways, because a lot of them don’t make a full time income on performing alone. If you love being on stage and playing music for other people, consider working towards a performance career. There are many performance jobs out there, including orchestral positions, pit orchestras, musical theatre, opera, chamber groups, and solo jobs. It can be tough to get started in a performance career, so be sure to never stop working and building connections. Music education is a major at almost every school that has a general music major. Why? There is a a growing need of qualified music educators. Even though school budgets have cut many music programs, there are other places where you can teach music. You can teach anyone from preschool to adult, and you can teach for a school, a community center, or on your own. You can even teach music online with some programs now. If you enjoy working with people and you are good at helping others learn, consider being a music teacher. There are dozens of ways you can teach music. There are the traditional teaching careers: K-12 teaching in a public school and college/university teaching. With the advancement of technology, however, there are even more ways of teaching. You can also set up a private teaching studio, where you teach who and what you want. Your studio could be online, out of your home, out of a music store, or a combination of these. Music therapy is a growing field. It combines music with other therapy techniques. Music therapist work with people with disabilities. They use music to help patients in various ways. This includes allowing a person with autism to express themself or helping a patient with early stages of dementia slow down memory loss. While it is a new field, music therapy it is a legitimate career path with a growing number of jobs. If you want to work with people with disabilities and you are patient and caring, consider being a music therapist. You do need special training, either a bachelors in music therapy of a bachelors equivalent for those who already have a degree. If you are interested enough and willing to do the work, music therapy can be a very rewarding career. Music therapists either work in hospitals or for themselves with a private practice. Some even work in music stores. Another new way to make money as a musician is by writing articles, blog posts, and even books. With the internet, it is even easier to write and publish a book on your own. A blog is even easier to set up. There are a few different free platforms where you can start a blog. The most common are WordPress.com and Blogger (Google). I started this blog on Blogger, because I could use my already active Google account to set it up. Blogger is totally free, and it allows more features than the free plan on WordPress.com and other “free” blogging sites. Other free sites usually have some strings attached. The platform might post ads on your blog, and they keep any profits. Free blogs also have certain limitations on what you can do. And almost all of those free sites? They can claim ownership of your content. They can even shut down your site if they feel it goes against their policies. Whether on your own website, a free blog, or in a book, writing is a great way for musicians to make a living. Writing is flexible; you can do it from the couch or in an airplane. A blog is the easiest way to get started with writing. It can build your web presence, and you can figure out if you like writing enough to make it part of your career. One popular career path for musicians is composing and/or arranging music. Composing is pretty straightforward. You write new music. Arranging is where you take music already written and write it for a new instrumentation. An example would be a concerto written for a solo instrument with piano accompaniment. A concerto, by definition, is for a soloist with orchestra. But since most musicians don’t have easy access to a full orchestra, music publishers will make and sell arrangements with piano. If you are good at improvising or you like experimenting with new instrumentations, composing and arranging might be the path for you. Composers and arrangers either work for themselves or with a tv or film company. A film composer writes music for film and television, and is sometimes even a full time employee. Most composers do start off self employed. There are dozens of other career paths for musicians that we haven’t even touched on. If you would like to see a part two in the future, leave a comment below!